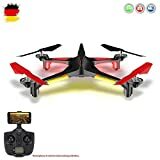 · THE FIRST DRONE FOR BEGINGERS AND CHILDREN: Drocon CYCLONE was made especially for those who have no experience and want to start their flight experience with an excellent drone at a good price. · A RETURN BUTTON: Press the return button while flying in HEAD MODE, and the drone will return automatically. SPECIFICATIONS: Product Size: 31.5x 31.5 x 6 CM / Weight: About 105g / Control Distance: About 80 Meters / Charging Time: 60 ~ 80 Minutes / Flight Time: 8.5 Minutes.